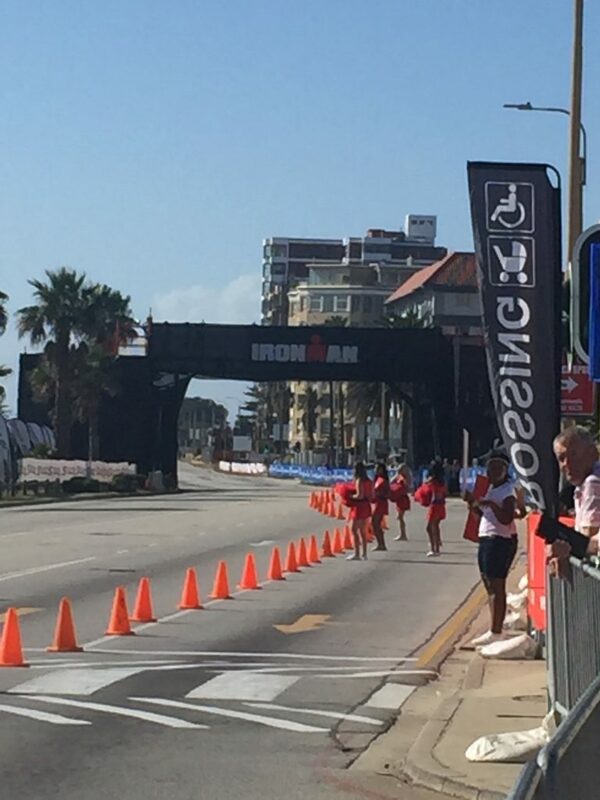 Last month I was lucky enough to race Ironman South Africa (Ironman African Championships). 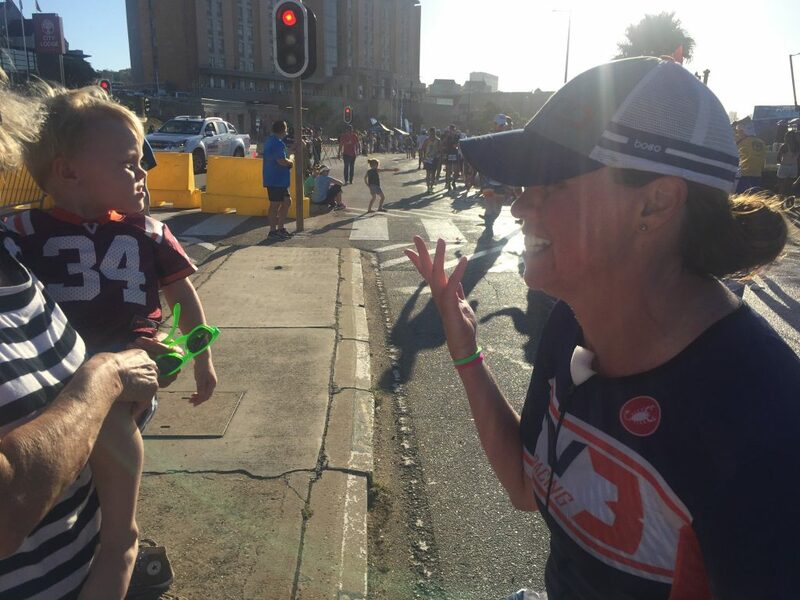 My Husband, Scott, is from South Africa and the location of the race was his hometown, Port Elizabeth (Nelson Mandela Bay). He and his brothers would even launch their inflatable boat (rubber duck is the South African term) on the same beach from where we would do the swim and transition. We were already going to be in South Africa for a family wedding 2 weekends prior so I decided to race with the many thanks to the family that supported all the logistics involved! An added benefit is I would learn some useful information on the race that could help my athletes, friends and maybe even an internet visitor to this site racing 70.3 Worlds this year; as it’s at the same location as Ironman South Africa (IMSA). Here is some of the scoop I learned on the course specifics, nutrition and logistics. It’s focused on travel from the US but many parts are applicable to traveling from other locations. The swim is located at Kings Beach about 1 mile from the expo (The Boardwalk) and the location of the swim for IMSA (Hobie Beach). It is a rectangular swim. I recommend at least one practice swim to work on figuring out site lines etc. A big harbor with cranes is located off to the distance that may be useful for siting. It’s a protected bay but can be wavy. Some days the course was quite rough but other days almost flat ocean swimming. Prepare at home by practicing ocean swims and starting from the beach if you have the capability. The bike is slightly different than the Ironman course. The two biggest things I found were the roads are very rough as well as the potential for very high winds. Potholes weren’t the issue but just a really rough surface. Not as much an issue in a 70.3, but can tire the body more than a smooth course. The course itself is one of the most spectacular bike rides I can remember with tide pools, beach vistas and sand dunes. My Father-in-Law told me that Port Elizabeth is the second most windy city in the world to Chicago. Two days before our race the wind was whipping at more than 25mph sustained. It was crazy and luckily we didn’t have that wind on race day. The prevailing winds are easterly or westerly which can make for some fun headwinds on race day! The biggest climb is right at the start of the ride, ~200 feet over about 7 miles. Nothing like the 2017 Chattanooga starting climb! There are some additional climbs near the turn around but much shorter and about 50-75 feet in climbing each. The rest of the course is flat to false flattish of ~1%ish with some long stretches of minor grades and some light rollers. If you can before the race, drive the race course. I highly recommend if you do ride it you do the group ride that is in the athlete guide as especially in the first several miles you will be riding on roads with lots of traffic (watch out for the many taxi-vans!!). If you cannot do the group ride, I would recommend going out on beach towards Summerstand and on to Seaview (the second half of the course), and skipping the city part all together (the first part of the course). Not to be forgotten, you drive on the left side of the road in South Africa! This is another reason to do a pre-race ride if you can to get acclimated to riding on the other side of the road! The run is very similar to what we did at IMSA. It is pretty flat. And probably the most highly spectated race than I have ever done and includes cheerleaders! There are several sections where the people were several deep. The South Africans take their sport VERY seriously! Many are not triathletes but just fans of Sport. 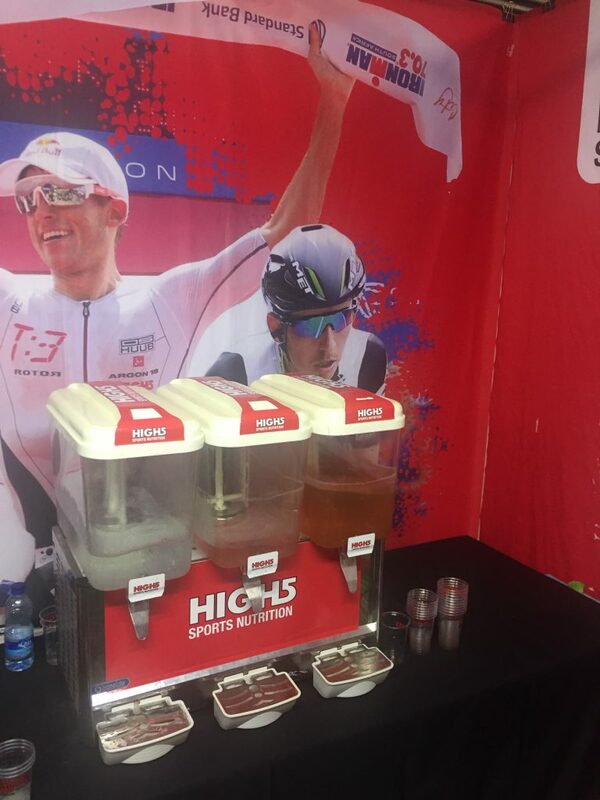 You will get many offers to join them for a beer while you are racing. So fun! There are two hills on the two loop course. Both are at the turnarounds. I recommend checking these out before race day. We did the second one during the Ironman and it was not steep at all! This course has about 1/3 the elevation gain of the hilly Chattanooga 70.3 Worlds course. 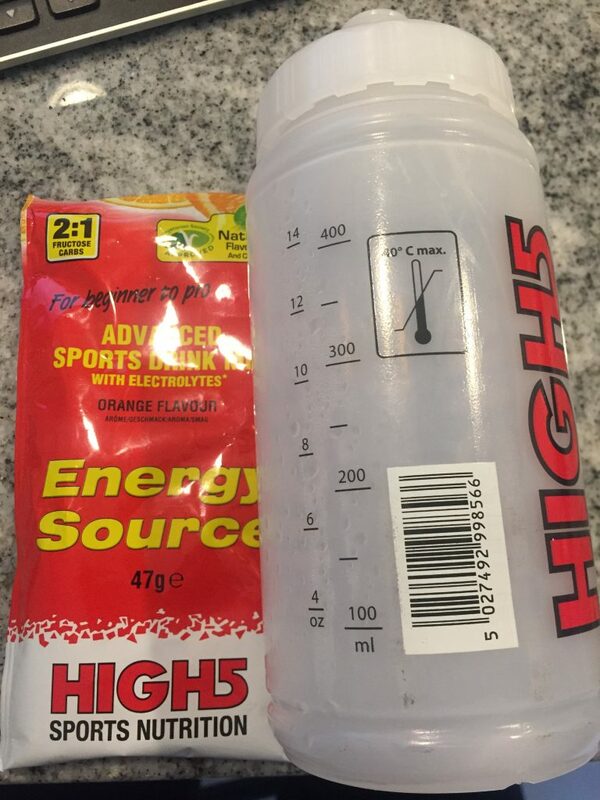 The specific High5 drink is called Advanced Sports Drink Mix Energy Source (now apparently called Energy Drink). The flavor on both run and bike courses was Citrus. Nutritional information in South Africa is listed differently than in the US and can be a little confusing. On the bike course it was passed out in these small bottles that were filled not all the way to the top. Each was filled with about 13 ounces. On the run course High5 was in standard paper cups. Doing some conversions, I estimate that each ~13 ounce bottle has about 150 calories and 200mg of sodium. Also, on the run course, the water is provided in sealed pouches of about 3-4 ounces. To open you just tear off a corner by biting the corner. They are actually quite convenient as you can carry it with you as you go. But watch at aid stations, they can become slippery on the ground! Since I am from the Northern VA area, this is centered around leaving from Dulles or the East Coast. The “quickest” way to get there is on South African Airways – “17 and change hours” to Johannesburg – but note there is a layover in West Africa where you don’t get off the plane and wait as people deplane and board. This layover is typically in the middle of the night. Not very pleasant. Another option is to fly out of JFK on South African Airways or Atlanta on Delta. The flights are 15 hours and non-stop! There are also several options flying through Europe, UAE or Qatar, but the time to Johannesburg is going to be 4-10 hours longer. Going through Europe/Middle East also allows you to fly to Cape Town. Then once in Johannesburg it’s another 2 or so hour flight. The race site is only a few miles from the Port Elizabeth Airport. We carried my bike on our flights (we actually did 7 individual flights on the trip). I have a Ruster Sports Hen House bike box and it worked perfectly. On the domestic flights within the country we paid for the bike in advance. It worked out to about 25 US dollars (R300) per domestic flight which was mcuh cheaper than paying oversize and extra baggage weight fees. The bike was free as it was included in our baggage allotment on our flight from the US. Happily my bike made it on every flight on time! 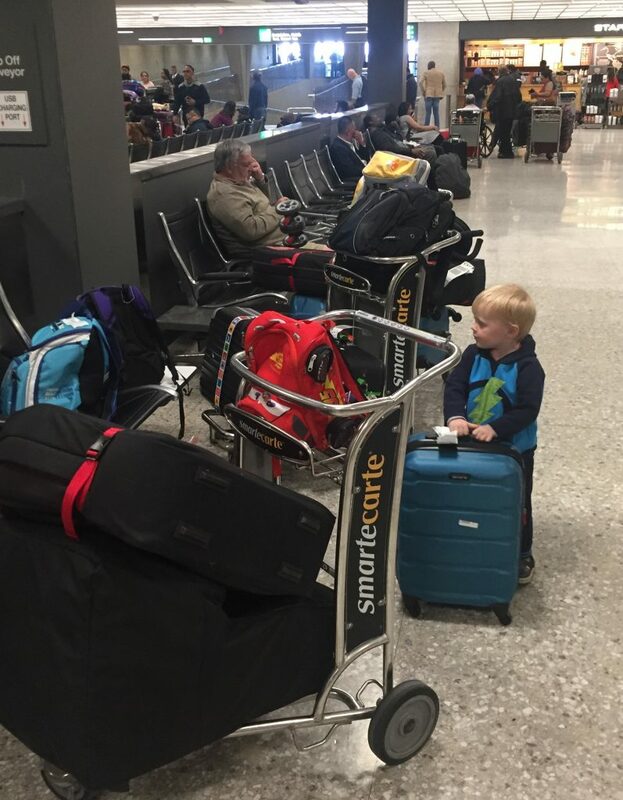 6 people, 7 flights, 20 days, 6 pieces of luggage, bike box, stroller, car seat, 6 bookbags and no lost or delayed luggage – MIRACLE! There are quite a few hotels along the run course. I am not sure how many still have availability but most seemed to be centered around the Boardwalk area where the expo is located. If you are unable to find available rooms near the Boardwalk, I would recommend looking towards the beach area of Summerstand over Humewood. Prettier, and felt safer. We stayed at one of the Lodge properties and it was suitable and very convenient. I found racing in South Africa to be very organized. The race briefing was listed as mandatory and I am glad I went. They really explain everything that you need to hear and it’s much more complete than the ones in the US. You won’t get the Athlete guide as early as you want (only a few weeks before the race) but once you get it, I found it VERY helpful. The race itself had more officials than I had ever seen at a race. Many more than a big US Ironman on the bike (better than Texas – HAH) but what was most different was the run. There were officials walking down the center of the course. I saw at least 10 different ones race day! For example, they were strictly enforcing the exposed chest rule on male athletes. 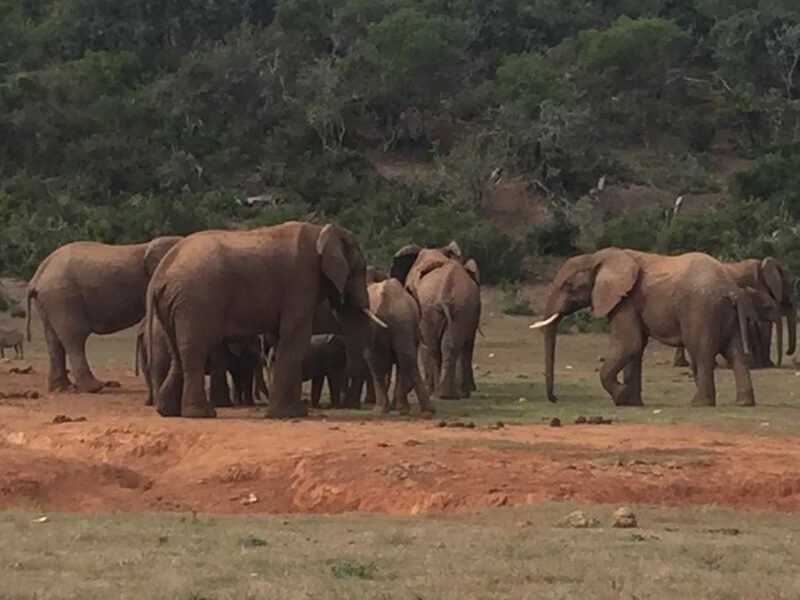 Addo Elephant park was excellent! Highly recommend it, especially if you don’t have time to do another side trip in South Africa. Near the bike turnaround in Seaview is a predator park. Scott went on his last trip to South Africa and really enjoyed it. That being said if you are traveling that far I highly recommend visiting some other parts of South Africa. This could be a post in itself but my favorites on this trip were Stellenbosch wine farms (great riding too!) and Cape Town. 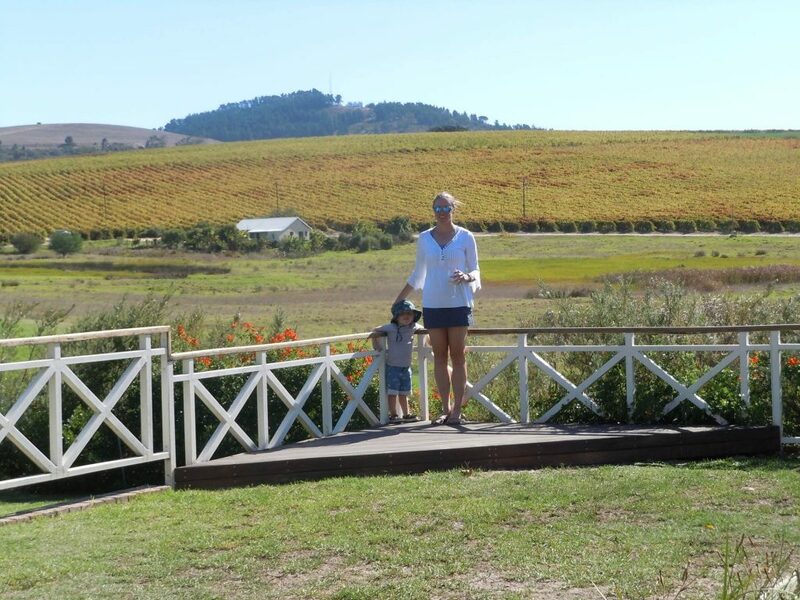 Mulderbosch Wine Farm – also had the best pizza I have ever tasted. One thing we didn’t have time to do this trip was a Safari or visiting a game reserve. There are private game reserves about 1-1.5 hours from Port Elizabeth, but they can be pricey ($300-600 per person per night). Large national parks such as Kruger are a 2-3 hour flight away. Note: Whale watching season is in September and worth a trip to Hermanus or Plettenburg Bay. Food, restaurants, alcohol and groceries are VERY affordable in South Africa (hint hint one of the many reasons I loved the Stellenbosch wine farms). One of my favorite restaurants in Port Elizabeth is Something Good which is located in Summerstrand on the run course. Wimpy is an extremely affordable chain of diner like restaurants (perfect for pre-race and post-race breakfasts and there is one in the Boardwalk next to the expo). If you have kids with you on the trip you have to try out a Spur as most have a indoor play area staffed with a nanny and they have some level of “American” food such as steaks (they call them filets pronounced FILL-IT) and burgers. Grocery stores were underwhelming. Many things we are used to they just don’t have. I never found a bagel or applesauce. But they had some other cool things like meat pies for breakfast! The nicest (and most expensive most of the time) grocery store is Woolworths. Unlock at least one phone in your traveling group with your phone carrier and purchase a sim card in any grocery store or gas station. You can get 2GB of data for the equivalent of 10 dollars. Don’t take African Taxi-buses. When returning rental cars really look over your receipt, they sometimes like to try and sneak over-charges. The trip to South Africa was just amazing. We had a fabulous time. Hopefully reading this blog helps with your planning to South Africa or helps you make a decision whether or not to take a slot. Email me at fiv3racing@gmail.com if you have any questions! 2017 Ironman World Championships Fiv3 Athlete Preview!